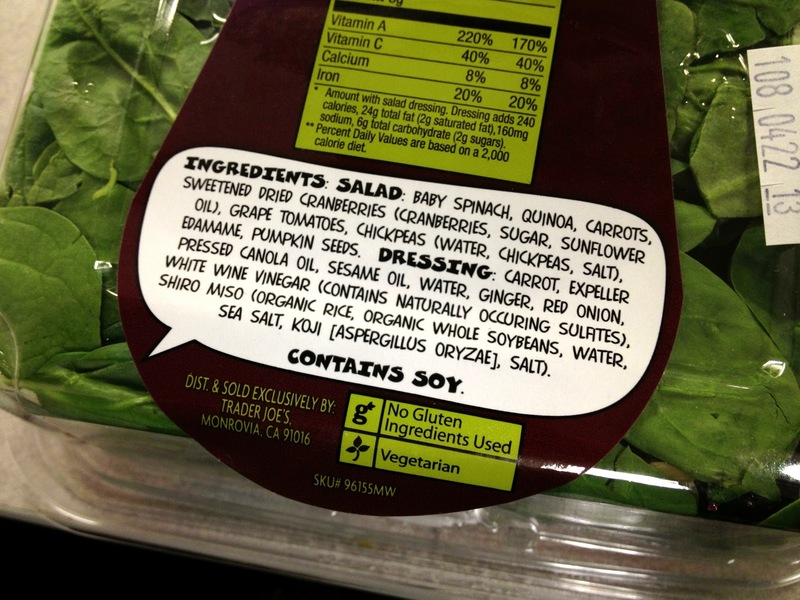 I purchased and ate a few new-to-me items this week and wanted to share my thoughts on them. After I compiled the photos for this post, I realized that all of these purchases were influenced by other bloggers purchases'. 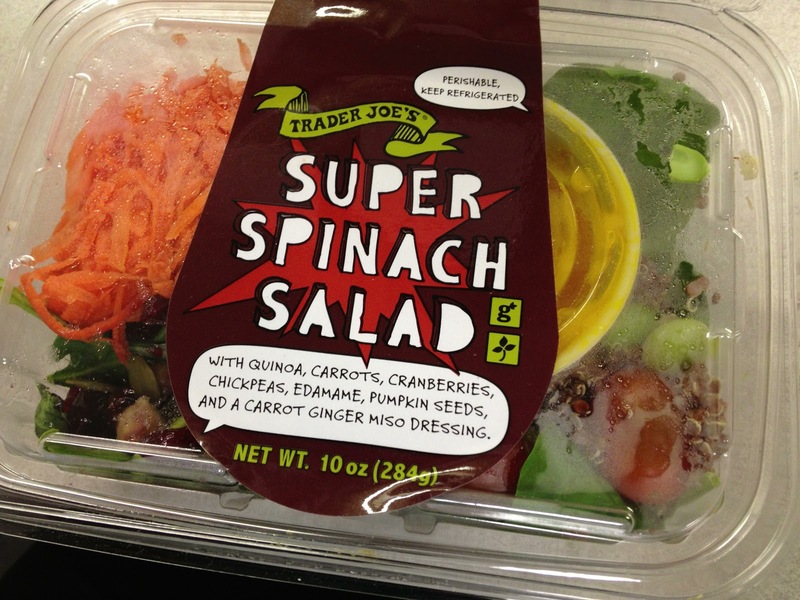 Karis blogged about this Trader Joe's Super Spinach salad not that long ago and it looked like something I'd love, so I picked one up over the weekend. It was very yummy and something that is easy to recreate at home. I didn't love the dressing, but I am not a huge fan of ginger flavored food. I saw these Blue Diamond Toasted Coconut almonds on a blog a couple of months ago and the author mentioned that she got them at Target. Until yesterday, I kept making my weekly Target visits, forgetting to look for these. I was so happy to find them and tried a couple when I returned home from the store. The verdict? I love the flavor, but realize that it's not something I want to purchase regularly since raw almonds are better for me in the long run. They still make a great snack to keep in my work desk drawer. 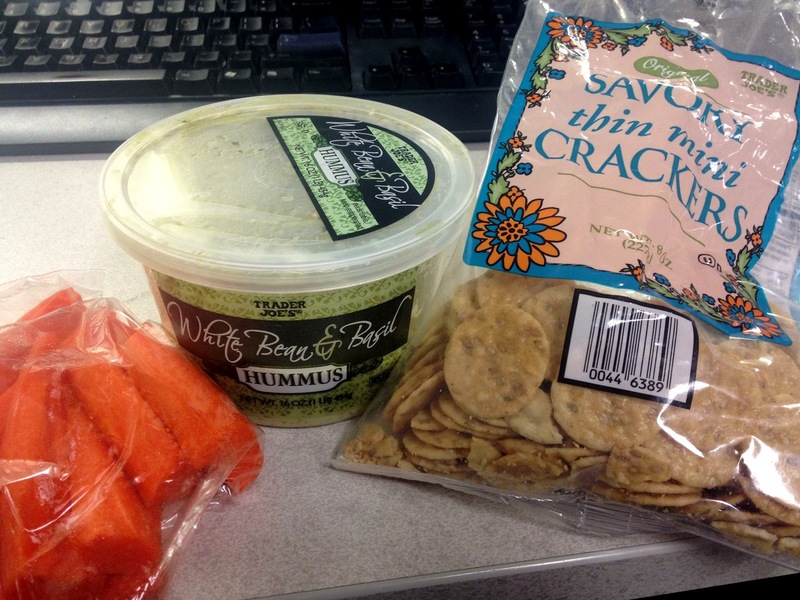 Tina blogged about the Trader Joe's White Bean & Basil hummus and how she liked to eat it with the Savory Thin mini crackers from TJ's. I enjoyed this hummus flavor, but now I find myself getting a bit sick of it after eating it off and on all week. I paired it with some carrots today to get some veggies in my diet. Have bloggers influenced you to buy anything new lately (food or non-food item)? 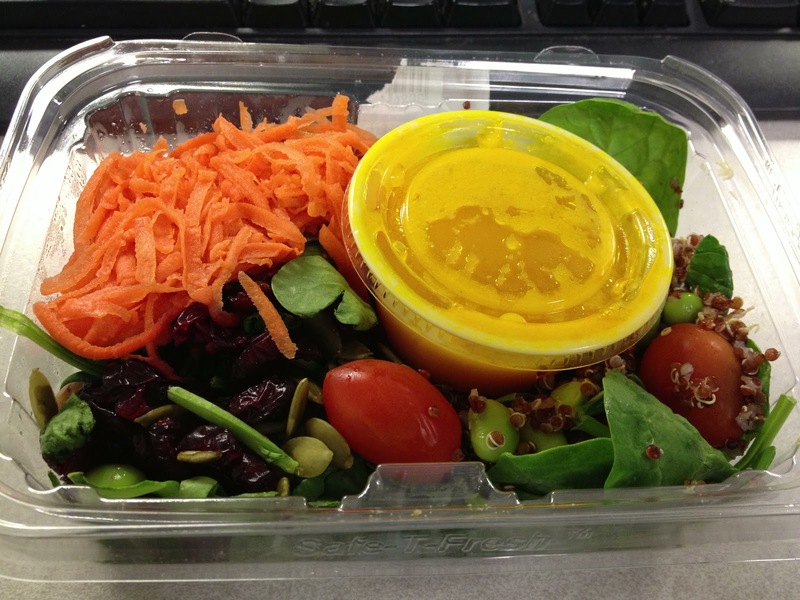 I've felt like I am in a food rut recently, so I keep looking for new items to try to get myself out of this funk. Thanks to Business2Blogger, I tried out Gaiam TV for the last month and a half. It is $9.95 per month to subscribe to the service. Gaiam TV offers a fun way to experience being challenged in your workout sessions, even if you do belong to a gym or exercise outdoors regularly. 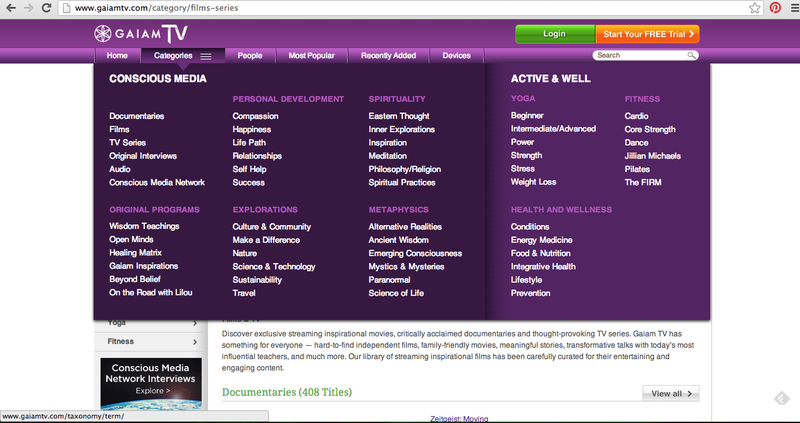 Gaiam TV's videos are broken down into two main categories: Active & Well and Conscious Media. Besides trying out the workout videos under Active & Well, I really enjoyed watching documentaries like Fresh or videos on topics like weight loss and digestion. -It was so nice to easily find exercise videos and experience new and challenging workouts. I was happy to find many videos from Jillian Michaels, who always promises to show you a tough and sweaty workout. If you like a certain fitness or yoga instructor, you can find their videos under the "People" section of the site. Here is an image of the "People" section, which had a nice clean look and was simple to navigate to find your favorite fitness or yoga instructors. -I hooked up my laptop to our TV using an HDMI cable and the videos appeared on screen very quickly. -I thought Gaiam TV was easy to navigate. I especially liked browsing the site using the categories section. When I was in the mood for a core strength workout, I could browse that site and choose a fun new video to try out. -The descriptions of the videos were nice to read through before deciding to watch. The preview feature was also quite nice. -Sarah from A Gutsy Girl alerted me to the fact that she even had her own collection on Gaiam TV! Check it out! The collection features videos like Mayo Clinic's IBS diet and nutrition, Yoga for IBS, and Fat, Sick and Nearly Dead. 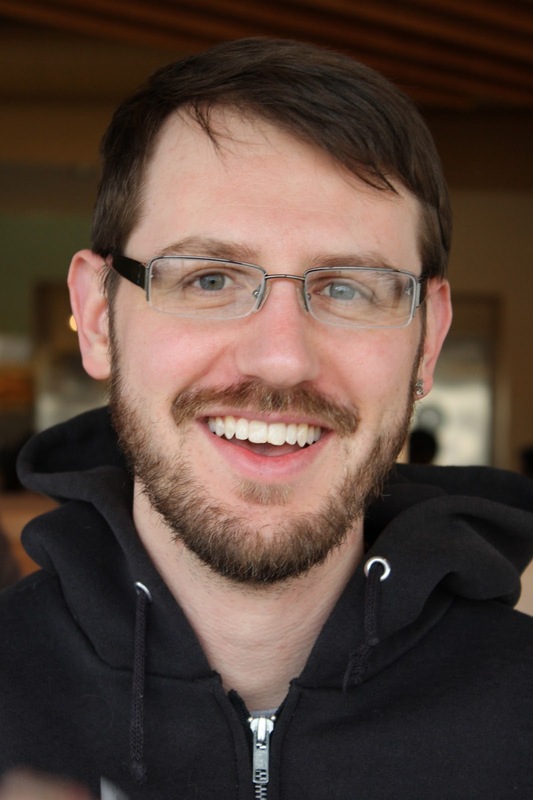 It was fun to see a blogger friend's familiar face on the website. I really trusted the videos she curated and enjoyed watching them since we both struggle with digestive issues. -At first, using Google Chrome or Firefox, the site did not allow me to connect via my Macbook without a certain plugin. I went into Safari and was able to access the site. After that, I had to wait a month to use the service (because our TV died) and then I had no problems logging in using Chrome. Other than that small technical issue, I don't have anything negative to say about the site. It seems like they are adding new videos quite often, which is really great for keeping paying subscribers. You can see what's new under the "recently added" section. If you want to try Gaiam TV out for free for 10 days, check out their site and start your free trial! You can browse the site without having to be logged in. I received a free trial to Gaiam TV through Business2Blogger. I was not compensated for my review. Craig and I went to Sobelman's Pub and Grill on Friday night. Thanks to a twitter contest run by the restaurant earlier in the week, I won a free burger and wanted to redeem it. It was our first time visiting the restaurant, which I had passed by for years when I commuted to work that way. The place was packed when we walked in and we were told we'd have an hour wait. We left the restaurant and came back 45 minutes later to find that our name had already been called. We sat at a high table near the bar, with music blaring above us and lots of loud chatter surrounding us. It definitely wasn't our type of "scene." We wished we had been seated in the back room, which looked crowded, but atmospherically better (for two people who prefer more quiet restaurants). Craig ordered The Sobelman burger, while I had a Veggie burger. He opted for cheese balls on the side instead of fries (basically, these were fried and breaded cheese curds). Craig liked his burger overall. My veggie burger seemed like it was made on-site (vs. frozen and made by a veggie burger company). It was crumbly, but tasted fresh. I stole Craig's cheese ball dip for my fries, which reminded me of the Saz's dip that I love so much. In terms of service--our waitress was attentive and friendly. Our only complaint was the lack of service we got when we first arrived and wanted to get on a waiting list. People kept streaming in behind us and we were first in line. I think we waited at least 10 minutes to get our name on the list. On Tuesday night, Karis, Molly, Abby and I went to the MKEfoodies event at Wolf Peach. Wondering what Wolf Peach means? It's a reference to the fact that throughout northern Europe, the tomato was thought to be poisonous. German folklore associates the nightshade plant with witches and werewolves, which gives a scientific name that translates to "Wolf Peach." The restaurant was formerly Roots and I had been there once before with Karis. Executive Chef Dan Jacobs was the chef at Roots and like 90% of the staff working at Wolf Peach, he still continues his role. All proceeds from the night went to The Gathering, an organization that feeds the hungry through preserving donated produce from area farms. I love ciders, so I was happy to find a new-to-me cider on their menu, Ace Cider out of Sonoma, CA. I ordered a Perry and it was perfect--not too sweet. I definitely want to see if I can find these in the store (sadly, I checked and it isn't sold in my area). We sat downstairs for the event, but the upstairs was very pretty and inviting. 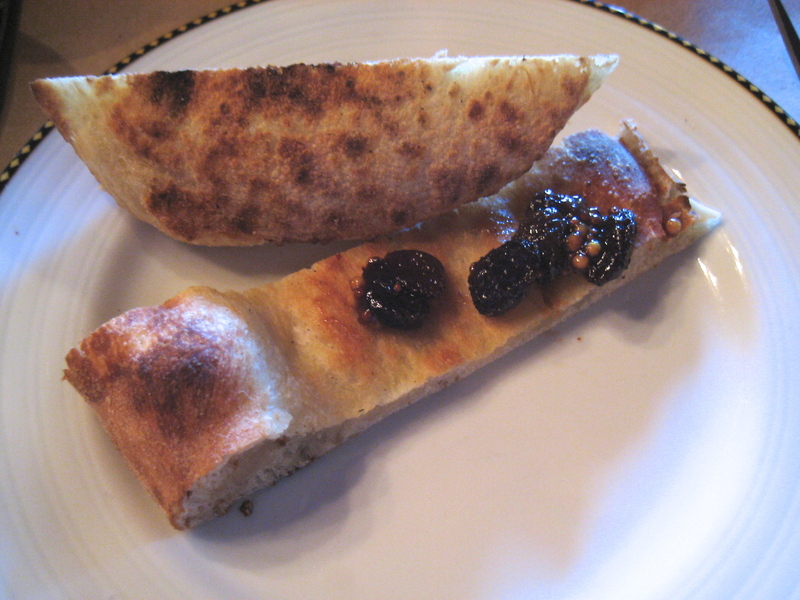 We started with various types of breads and house-made charcuterie. 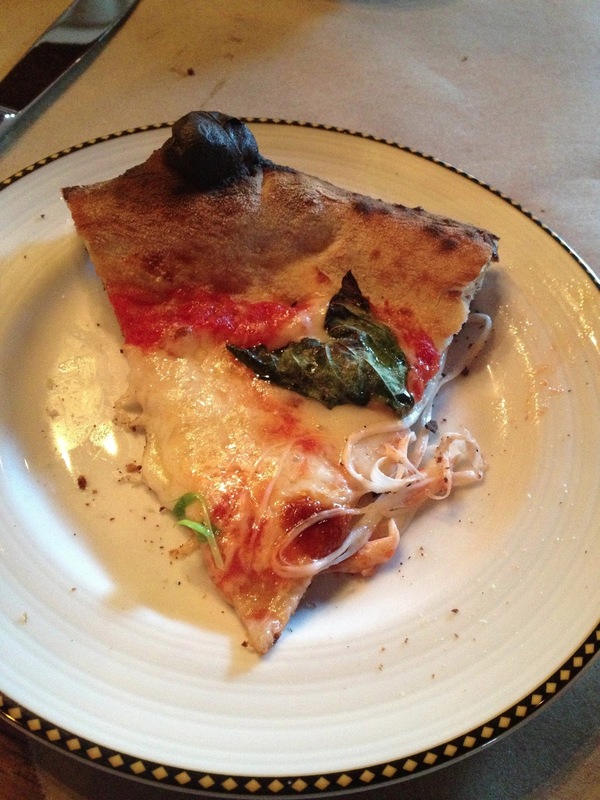 Many of the wood-fired pizzas that were brought out were vegetarian, which made Karis, Abby and I very happy! There were a few giveaways throughout the night and I was so excited when my number was called and I won a $50 gift card to the restaurant! I can't wait to take Craig there in the future and sit out on the patio on a nice summer day. I'm looking forward to eating delicious food at my next visit to Wolf Peach and to seeing these gorgeous views of downtown Milwaukee again. If you love yoga as much as I do, you will want to check out a brand new site, YogaOutlet.com, to shop for yoga clothes, accessories, gym bags and more. · The largest selection of yogi apparel and gear. They currently have over 50 yoga brands. I found it hard to decide what to order and in the end, I was practical and got two items I needed for my yoga practice: a new mat and yoga friendly shorts. It was easy to search for mats by mm thickness, brands, colors, etc. 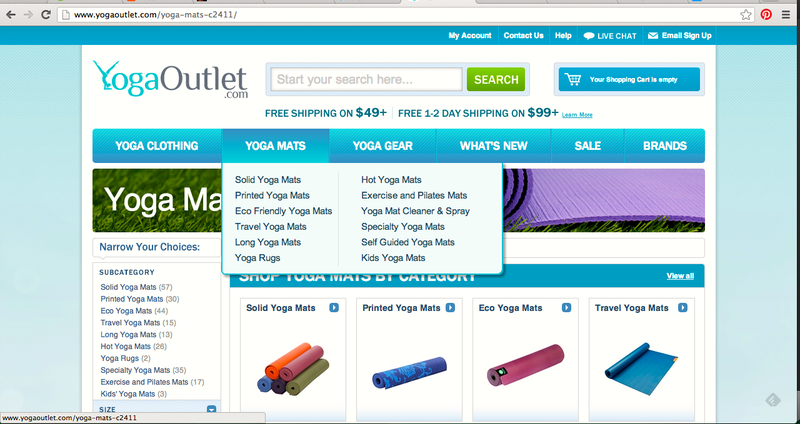 and I really enjoyed navigating the YogaOutlet.com site. They feature a lot of great brands that are familiar to me and some new-to-me brands as well! 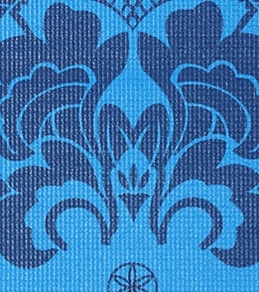 I ordered this Gaiam mat with a beautiful pattern that is sure to make me feel calm during practice. 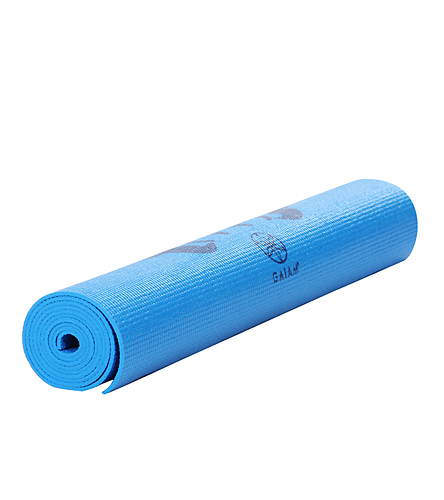 It has a 3mm thickness, so I may end up doubling up with my old mat since we practice on a wood floor at the gym. I also wanted some shorts that were meant for practicing yoga, so I went with these Brooks Glycerin style grey shorts. They have a spandex boxer built in underneath and these will be great for my summer practice. I tried them on and found them so comfortable and really flattering! 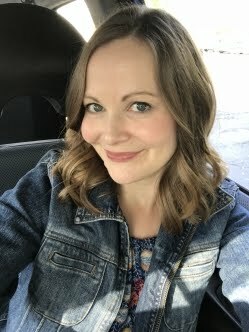 I'm giving away a $25 gift card to YogaOutlet.com to one lucky reader! Check out YogaOutlet.com and let me know what you would purchase with your gift card if you won. Please leave your e-mail address in your comment. No e-mail address = no way for me to contact you. -Follow YogaOutlet.com via twitter and tweet about the giveaway, "@lisalivingwell is giving away a $25 gift card to @YogaOutletcom: http://bit.ly/ZyvR8g"and link to it in the comments. -Like Lisa Living Well on Facebook. Rules: I'll take entries through Sunday, April 21 at 6 p.m. CST. I will announce the winner on this post and e-mail them directly. If you do not provide an e-mail address in one of your comments, I cannot contact you, so a new winner will be chosen. The giveaway is now closed. Thanks for entering! The lucky winner is Inger @Art of Natural Living! Disclaimer: I received a gift card to order items from YogaOutlet.com in exchange for writing this post. This did not influence my opinion of the site. 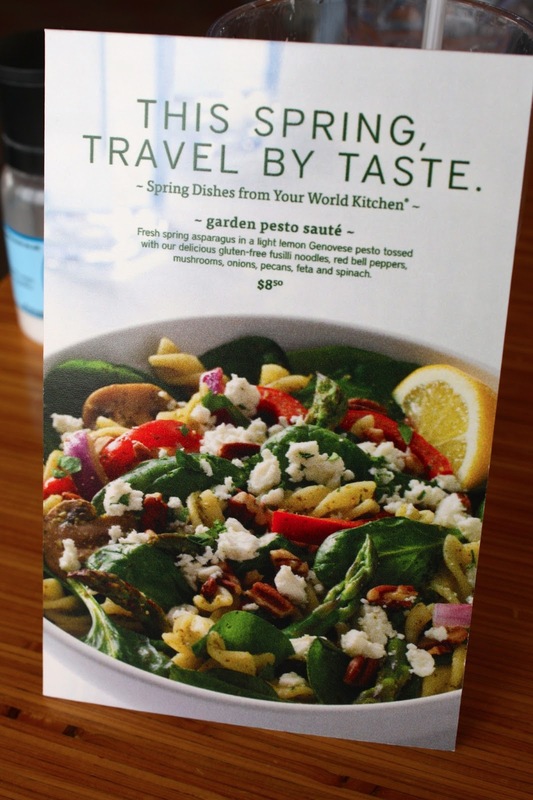 Noodles & Company Springtime Menu and GIVEAWAY! 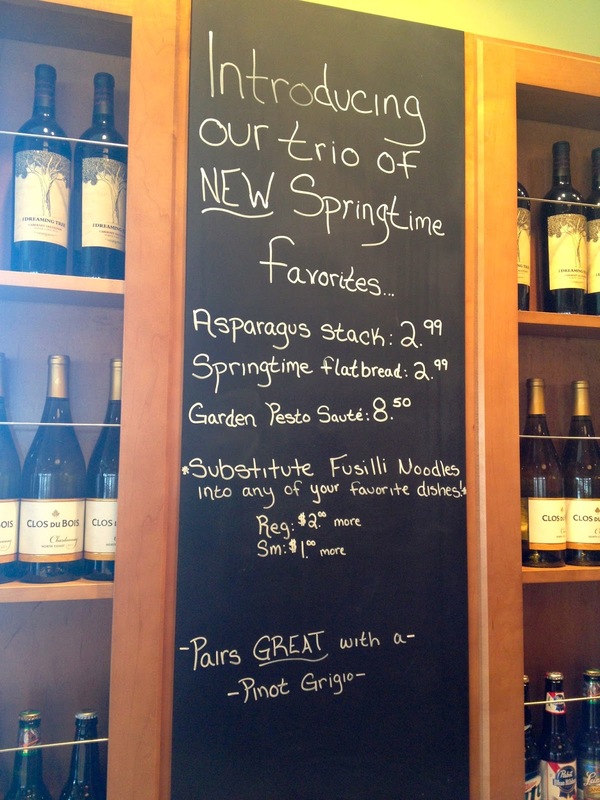 Craig and I visited Noodles & Company on Sunday to try out their new Springtime menu. Garden Pesto Saute - fresh asparagus in a light lemon Genovese pesto tossed with Noodles' newest gluten-friendly fusilli noodles, red bell peppers, mushrooms, onions, pecans, feta and spinach. The gluten-friendly noodles can be used in other menu items as well. Springtime Flatbread - a crispy flatbread appetizer topped with fresh asparagus, mushrooms, melted parmesan cheese and bacon. 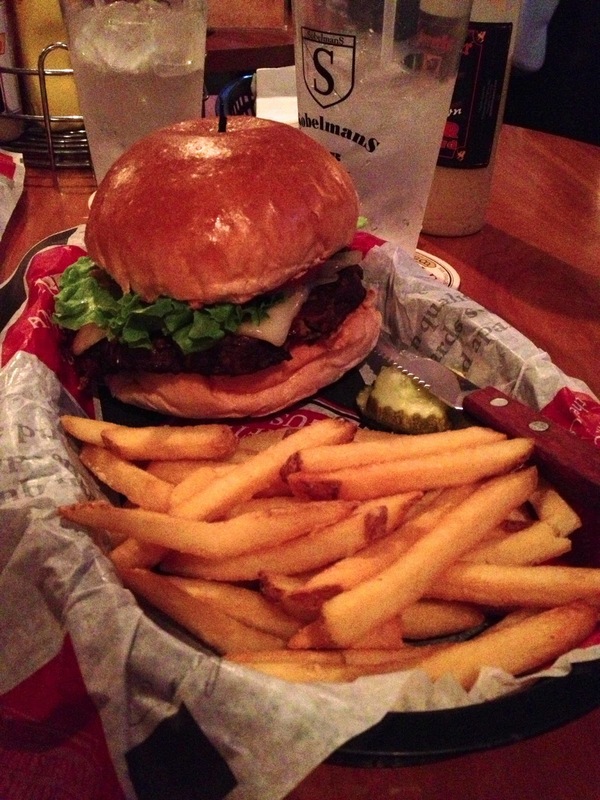 It's a great appetizer to share among a group! Asparagus Stack - a side of fresh asparagus spears, feta cheese, bacon crumbles and a wedge of fresh lemon. It's a wonderful way to add more vegetables to any meal. I ordered the Garden Pesto Saute with tofu, but I think I'll be back to order the springtime flatbread in the future (probably sans bacon). I like that every order at Noodles is made especially for you, so if I want them to forego adding the bacon to my flatbread, that is possible. I had fun snapping photos of my dinner date and I especially liked how this picture turned out because it captures his natural smile. I was happy to get my lucky number 13 for our table. Here is my meal! The only bummer was that they were out of pecans. I really loved this combination. It features a lot of ingredients I love and Noodles always seems to get the tofu just right. Even Craig tried the tofu and liked it. Craig had spaghetti and meatballs. Want to win two coupons for free bowls of noodles, soup or salad to dine at Noodles & Company with? 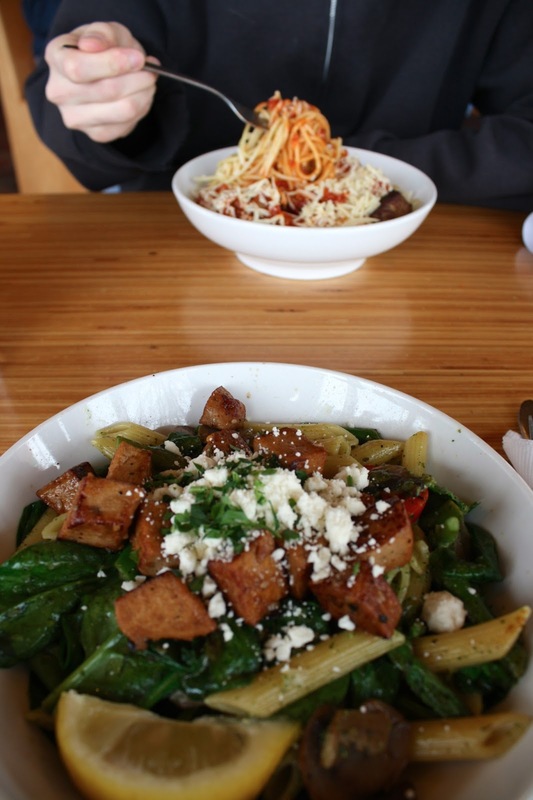 -Leave a comment about your favorite meal at Noodles & Company or if you have never been to Noodles before, your favorite pasta dish to make at home. Please include your e-mail address in your response. Additional entries (1 per item you complete). If you already follow me on any of the following social media sites, just say that in your comment and it will still count as an entry. Giveaway ends on Wednesday, April 17 at 9 p.m. CST. U.S.A. entries only please. I will post the winner here and also e-mail them directly. GIVEAWAY IS NOW CLOSED. Congrats to Nicole from Apples and Arteries! I was provided two free coupons for free meals at Noodles & Company, but that did not change/influence my opinion about our experience. I was not compensated in any other way for this post. Within the time span of one month, I get to see three people that I believe are a huge influence on my ability to "live well" and on others' ability to do the same: Michael Pollan, Jillian Michaels, and His Holiness the 14th Dalai Lama. Last week, we booked tickets to see the Dalai Lama in May at an event called "Change Your Mind Change the World" in Madison. Craig has seen him in person before, but this will be my first time. I am really excited to hear the other speakers on the panel too. 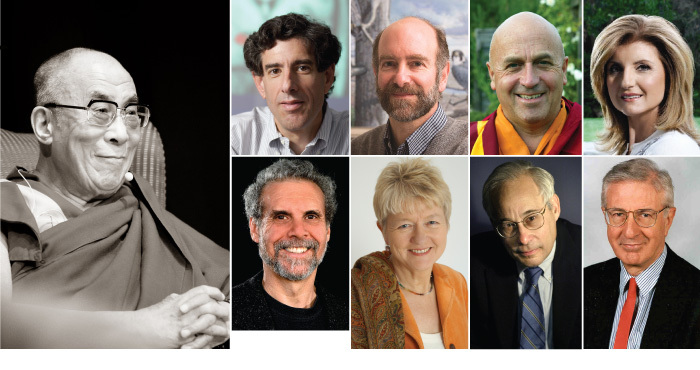 Conversations on Science, Happiness, and Well-being: 2:00 p.m. – 3:30 p.m. Opening remarks by David Ward, Chancellor of the University of Wisconsin-Madison. Panelists: His Holiness, the 14th Dalai Lama, Dr. Richard J. Davidson, Dr. Jonathan Patz, Matthieu Ricard; Moderator: Arianna Huffington. 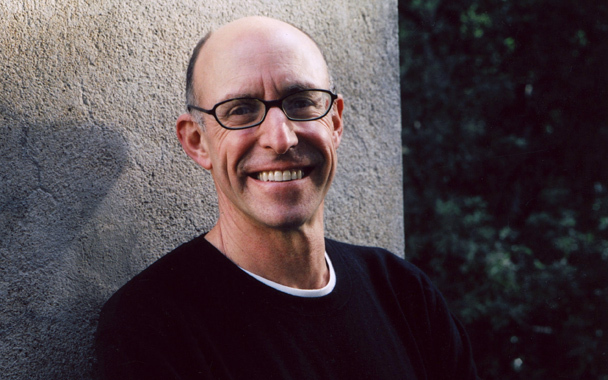 Michael Pollan's event is at the end of April. I still have not finished The Omnivore's Dilemma and really feel like I need to make that a priority before I see him, but alas, that may not happen with all of the other things I need to get done on the weekends. My friend Kim and I were hoping to purchase tickets to see Jillian Michaels when she is in Milwaukee on May 5th for her Maximize Your Life tour. Last week, Kim learned that her friend secured three comp tickets, so now I get to see her too! I just started reading her new book and I am loving it so far. I actually prefer her books over seeing her on TV. I am beyond excited for all three of these events! If you could see anyone in person whom you admire, who would you want to see? 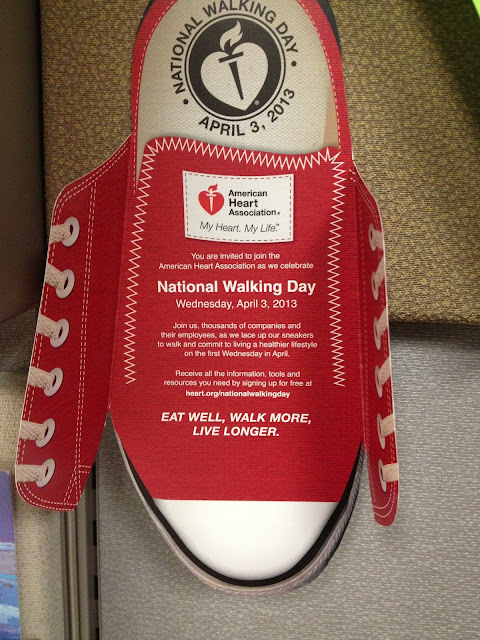 Happy National Walking Day! Hope you can get out and walk for at least 30 minutes today. I'll be walking on my lunch break with co-workers. I really prefer﻿ walking to running, so I am happy to celebrate this day by getting some exercise and fresh air. I can't wait until the weather warms up so I can get outside more on my lunch breaks. Where is your favorite place to walk? Mine is probably around Whitnall Park pond (pre-mosquito and horsefly season) or around our neighborhood.